Ethereal toning blended with the sounds of nature to lift the spirit and promote healing. The light body is the essence of who we were before birth and what will continue after death. It is the source of true spiritual awakening and healing. 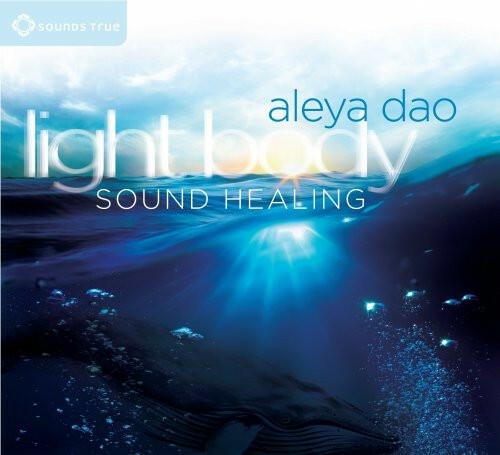 With Light Body Sound Healing, Aleya Dao offers an album of spacious music created to resonate with the listener at the subtle energetic level, helping us bring our physical bodies into alignment with our innate wholeness. Combining natural healing sounds such as whale song and flowing water with Aleya's angelic toning and tranquil music, this album creates a sound environment designed to transport you into another world—one beyond body and mind, in touch with the loving support of the spiritual dimensions. I have listened to a great deal of healing, balancing music both on media and live and this is my favorite by far. Aleya's weaving of sounds and voice is pure alchemical magic. As a workshop designer and presenter, a Reiki Master/Teacher, and an intuitive who gives sessions and readings, I utilize a great deal of music and media. I have not found anyone that made me feel like it is truly created by someone connected with the divine -- Aleya seems angelic. During these times of post-election dis-stress, I need deep soothing, and this is it. I just ordered six more copies of the CD, which I will give as gifts and ordered the download. I was very impressed at the samples before purchasing the CD. Aleya Dao's voice and music really deepens you on almost a meditative state, just by hearing it. So I bought the CD. For my surprise, the samples seems to be the very best parts of the tracks on the CD. What displeased me, was that when you start listening, her voice really gives a punch and it is very soothing, until, the weeping or lament sound of animals come to the song, that I found very disturbing. If the music didn't have them, it would be an excellent experience. As most of the tracks have them, I keep jumping parts to find the ones that are on the samples, that doesn't have the animal sounds.